Pac-12 • Simplified offensive attack puts big emphasis on RB. Chris Detrick | The Salt Lake Tribune Utah Utes running back John White IV (15) runs past Oregon State Beavers safety Lance Mitchell (10) during the first half of the game at Rice-Eccles Stadium Saturday October 29, 2011. Utah is winning 24-0. As John White goes, so go the Utah Utes. 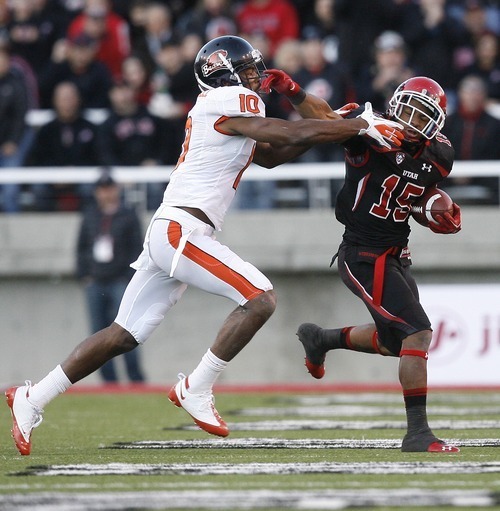 That thinking is the crux of Utah's stripped-down, no-frills offense for the rest of the year. After watching quarterback Jon Hays struggle in his reads and get knocked around like a pinball against Cal, the Utes decided the only way their offense would have a chance to win games was keep the ball on the ground as much as possible and rely on their defense to keep their games low-scoring. The Utes passed their first exam, beating Oregon State 27-8 Saturday with John White rushing 35 times for 205 yards and Hays attempting just 14 passes, completing six for 62 yards. But now comes the hard part: Can the Utes beat their remaining four opponents when everyone knows what the plan is? Utah coach Kyle Whittingham put the task of coming up with enough creative schemes to be successful within the limited offense at offensive coordinator Norm Chow's feet. "The challenge is to stay a moving target and not get pigeon-holed," Whittingham said. While in one respect that is exactly what the Utes have done by abandoning any thoughts of a balanced offense, the alternative wasn't very appealing either. Hays, who was sacked twice by Oregon State, claimed he felt great about the offense after the game, and why wouldn't he? It was a much better outcome for all involved than the week before, when he was sacked five times, threw three interceptions and fumbled the ball away. "We're trying to be smart with the ball and not turn it over," Hays said. "We hung in there and made plays when we need to." Working in Utah's favor is its schedule. Out of the four remaining opponents, only UCLA (4-4, 3-2) has a winning record, and the Utes get the Bruins at home on Nov. 12. The Utes play next at Arizona, which lost at Washington 42-31 Saturday and whose seasonlong struggles led to the firing of Mike Stoops on Oct. 10. Defensive coordinator Tim Kish is serving as the interim coach. Quarterback Nick Foles threw for 388 yards in Saturday's loss, but Arizona's defense couldn't stop Washington running back Chris Polk, who finished with 144 yards rushing on 34 carries and 100 yards receiving. Having to rely on the defense so much isn't ideal for Utah, but the way the Utes have played defense this year, safety Brian Blechen believes he and his teammates can be successful. The Utes held Oregon State to just 32 rushing yards and intercepted Oregon State quarterback Sean Mannion three times in claiming their first Pac-12 victory. Blechen is determined it won't be the last.